I absolutely love feeding birds in my yard as spring comes on. Each dawning day in February and March brings the possibility of a new visitor, be it sparrow (fox, field or chipping!) or grackle. Or anything else. You never know. So it was with delight that my eye picked up a different bird strutting, head up, across the lawn where I scatter corn for just such avian VIP's. Looking at him, I was cast back to childhood in Richmond, Virginia, where the "purple grackles" really were purple! This is the bird of my youth. The bird on the left, with the purple head. He's walking up to sass the bronzed grackle on the right. 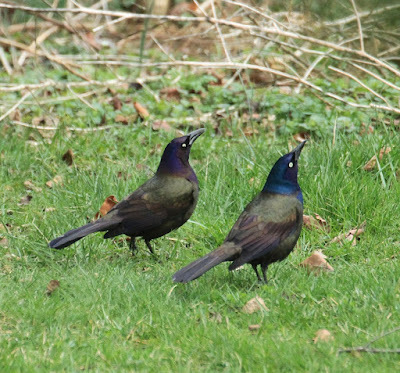 I remember so clearly the day in 1977 in Cambridge, Massachusetts, when I found a grackle who had collided with Hilles Library's windows on the Radcliffe campus. I picked it up and turned it over and over in my hand. Its back was bronzy green, and its head was a bewitching blue! 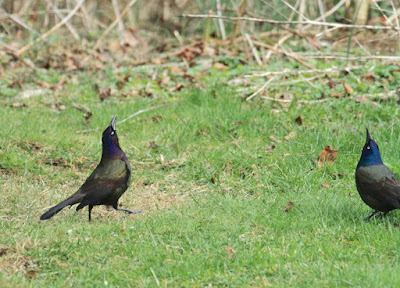 I'd never seen a grackle like this, and indeed it was the "bronzed" or interior morph I held in my hand. I'd grown up with the "purple" morph which inhabits the coastal plain from New York to Louisiana. I took it to the Museum of Comparative Zoology and made a pretty skin of it, and I trust it's still in the collection. 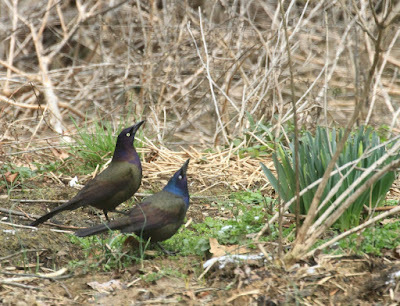 Now that I live in Ohio, all I usually see is bronzed grackles, and I don't see nearly enough of them. Many people don't realize that the "common" grackle is becoming less and less so, at least in the Eastern half of the U.S. In fact, Breeding Bird Surveys show a 32.4% decline in numbers from 1966-1993, and a 15.9% decline from 1984-1993. (This data from Birds of North America, AOU/ACNS). However, populations are moving west at a good rate, and breeding records are increasing in the Southwest, Wyoming, North Dakota and Montana. The decline in the East is suspected to be as a result of control measures. Birds that roost in great flocks are vulnerable to human persecution, especially when they are considered pests. Spraying the flocks with detergent on freezing nights, stripping the birds' feathers of protective oils and causing death from exposure, is just one of humanity's ways of striking back at flocking birds. It matters not that threatened species like rusty blackbirds and charming marsh troubadours like red-winged blackbirds often roost with common grackles; they're all "blackbirds" and they all have to die when a community of humans decides the flocks constitute a nuisance. All this flashes through my mind on the rare and welcome occasions when I see grackles at the feeder. 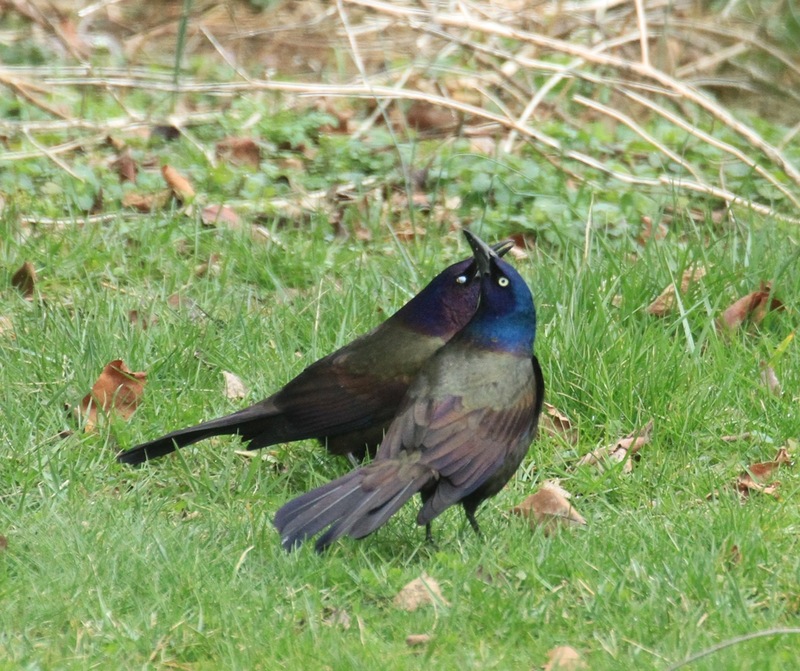 I wonder why so many people have an immediate negative response to grackles, and never stop to see their beauty and majesty. They don't see past their darkness to the rainbow iridescence that captivates upon a closer look. These grackles are engaged in a bit of dominance display over their sudden windfall of whole and cracked corn. Bronzed does a song spread, analogous to a red-winged blackbird's, but without red. He emits a harsh "KSHNNNNKCCH!!" Purple flashes his nictitating membrane because he don't care. Zombie grackle! and only wishing those daffodils were a week farther along when this rare coastal plain visitor happened to strut through the backyard on March 3, 2017. 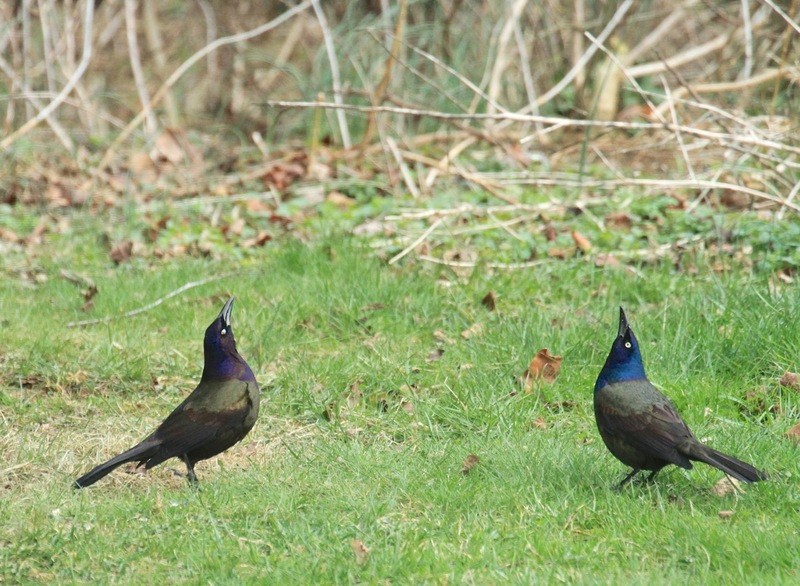 So the next time you see a grackle, throw him a little corn, and look a little closer. Ask him where he's from--coastal plain or interior? And wish him well on his journey north, and safe harbor in thick pines where he can help build his nest. He'll need all the luck he can get. I think grackles get a bad name because they hang out at trash cans a lot. If you associated a bird with trash you might think they are trash?? I mean, vultures are amazing birds and people get really grossed out by them because of what they eat. I think the association of that, and that many people don't really 'see' the colors within the bird, and therefore don't think they are worth anything. Count me as another fan of grackles. At the beach, we get boat-tailed grackles. With their long tails and lean bodies, they remind me of supermodel versions of their common grackle cousins. I particularly enjoy the color differences between males and females. Enjoyed this blog post, as usual. I always learn something! 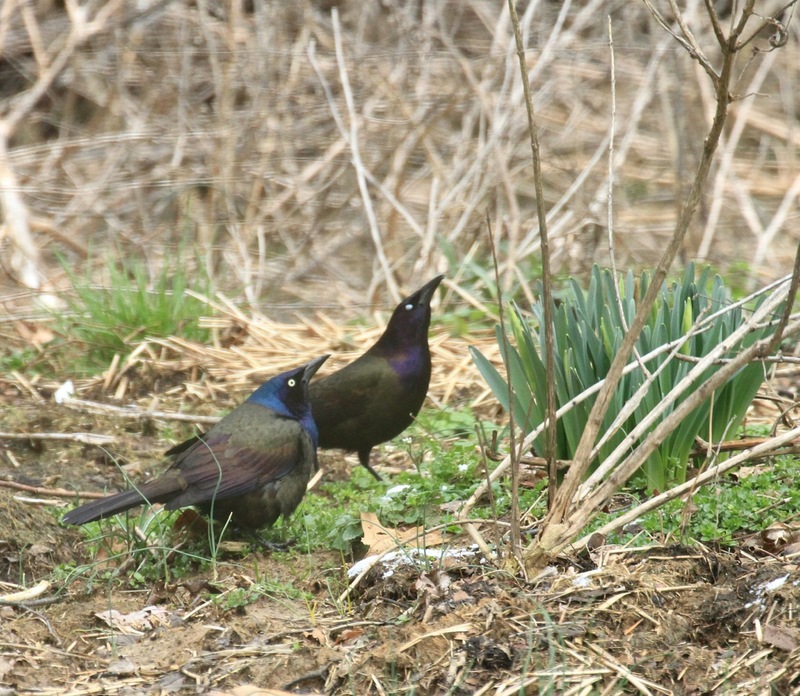 Grackles are wary and very smart. I remember from my youth trying to get close enough for a shot with my BB gun, didn't happen. Now in my By, they feed while I'm sitting on the swing about 20ft away. In both cases, they knew my intentions. 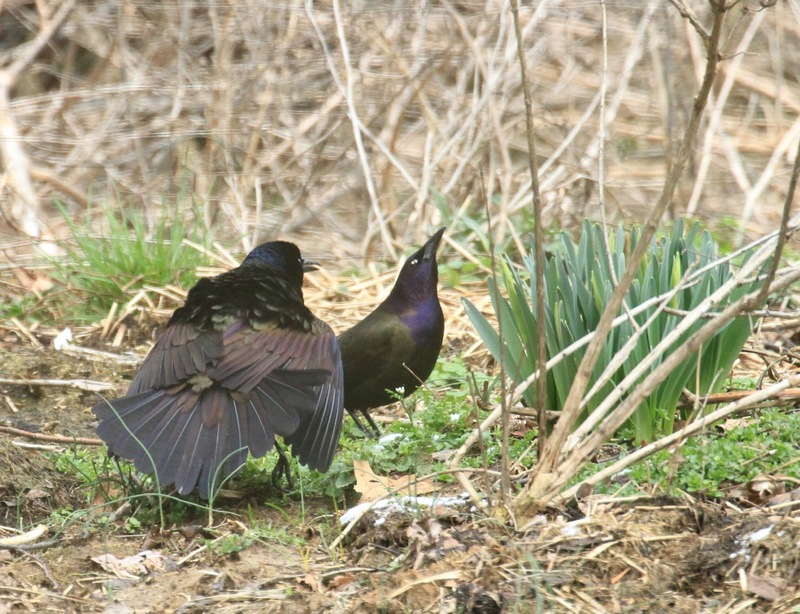 I love when the grackles arrive and noticed the upturned bill behavior. I found out quite a bit about them in A.C. Bent's accounts, and even more here! When they move through our area in fall there will be a dozen or so marching through our woods turning over leaf litter with their "Bill sweeping" motion. Insect beware! Thanks for a good read. I've seen both colorizations but blue mostly. I so enjoy your posts. Thank you for sharing with such heart and insight. Another grackle fan here. I'm always thrilled when I find some chowing down seeds, suet or corn in our yard. And on those rare occasions when huge flocks gather in our woods and all you can here is their mysterious crackling calls - well, that's just magic. Another fan of the Grackles here! I don't consider any bird a "trash bird". Which is more than I can say for people, particularly the ones that would kill an entire flock simply because they consider them a pest. People are the real pest; there are just too freakin' many of them on this planet! Enough with the "going forth and multiplying', already! Just returned from a visit to my brother in Florida. From his back patio each morning I was fascinated by the range of the the grackles' voiced calls, more like "talking", as Kimb noted. Thank you for highlighting for us these wonderful creatures upon their visit to your backyard. What fun! That's the kind of birding I like, studying the common ones. Getting to see him up close I was amazed at the wonderful range of colors that make up this "blackbird". 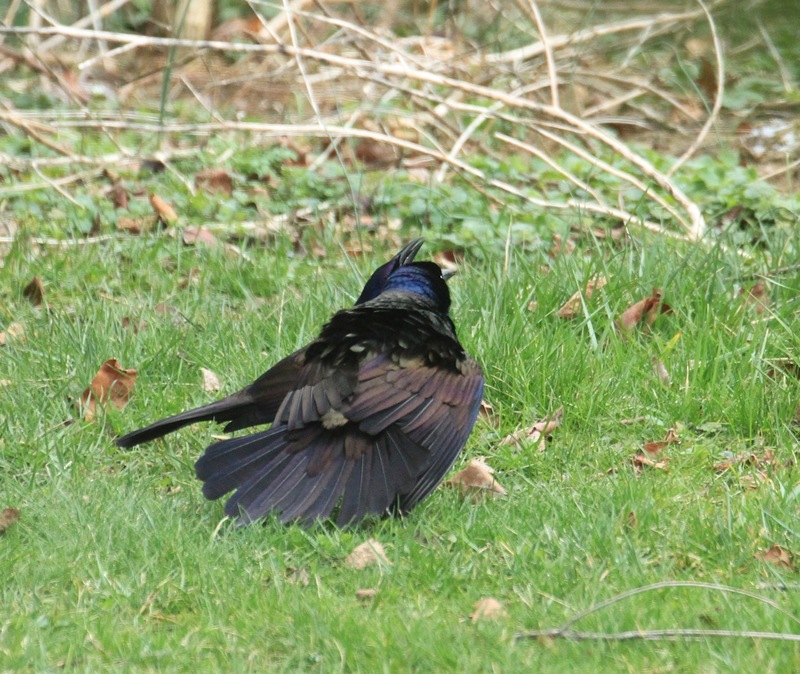 The tail feathers were a gorgeous deep navy. I love finding the beauty in "ordinary" things. Never been a fan but have admired color. They're such mobbers & hoggers of seed! But as you state fav red wings come with...my Spring harbinger!! Thanks for new outlook. Grackles are a Steeply Declining Common Bird" as reported by the USA State of the Birds Report. Chimney Swifts, Common Nighthawks, herring Gulls, Loggerhead Shrikes, Field Sparrows, and Horned Larks re also on the list. The grackles her come in two waves: the migrants, in the same tree, and the breeders. By the way, if I could get two posts (? sorry Julie/everyone)this type of conservation information burns me up. There we many more Passenger Pigeons, and we made them extinct. Flocks of blackbirds may constitute the entire breeding population for 250-500 square miles. Same with winter roosts of American Crows, though they seem to demographically recover quickly after an anti-crow measure by a government. Ring-billed Gulls a little slower, or they go somewhere else? Thank you, Julie, for the education effort, which is key. Hybrids and intergrades are hard to prove. More sightings of them may delineate the zone of occurrence, so that some more individuals of similar features from that zone may more easily be diagnosed as intergrades or hybrids. Many Citizen Science programs like eBird can do this. Keeping a written journal is still very important, too, in times of emergency of the grid or personal computer problems, to preserve the data. After your notebook is full, photocopy it and put it into a safety deposit box. Local, Time and date, observers, weather, temperature, andd wind speed on a Beufort Scale, perhaps a perpose and expectation, topology, habitat, species list with numbers of birds per spps., no. of total species, numbers of total numbers, divide the first figure from the last, and remarks on their behavior, incl. foraging, winter survival, and breeding notes, etc. It hurts to hear that some people think some birds are "trash" birds. Not true. Why on earth would they be here if they were "trash?" Mother Earth doesn't make trash. As for humans--well, there are trash humans who don't "get" nature. And I ditto mimimanderly's sentiments. Thanks again for the enlightening post, Julie. Love your deep understanding of birds and nature in general. Your blogs are a gift. I just love me a Grackle of any kind and was just singing their praises the other day too. They are such lovely birds with or without the sunshine to show them off. I have to say though that I had never noticed there are purple and bronze ones, I'll have to pay more attention. I'm in southwestern Oklahoma and we see quite a few Grackles both Common and Great-tailed. I always love to see the males oil slicked colored feathers and their bright yellow eyes. Their displays crack me up. Ours often frequent large chain supercenter parking lots to nosh on dropped fast food bits. We have an older gentleman at our local supercenter that drives through the parking lot feeding them bread. I wouldn't recommend bread, but at least he's feeding them. Maybe someday I'll flag him down and recommend cracked corn. They definitely know when he's in the lot. Last year here in Cambridge, Ma I watched a grackle and a bluejay keep company pretty much all mid-summer into fall. Thought it was my imagination or coincidence, but they were consistently together. Don't know if it was because I discovered the blue jay adored peanuts & would catch them, and frequently, I swear, drop one for the the grackle would to eat. (There was corn too but peanuts seemed to rule). So far have only seen these gorgeous & interesting birds at Mount Auburn, where they wheeled around in little clouds. Love the way you noticed the interactions in this post.